The idea of having a blood transfusion in Nigeria is not one I find particularly attractive. However, if it is an emergency and I need to stay alive, flying over 5,000 miles back to London before I can get one is not really practical but a stupid move. Over a decade ago, I was in one of such situations and at first, I remember my parents were not eager but the situation was dire…my life was in the balance as the doctors tried to figure out what was wrong. 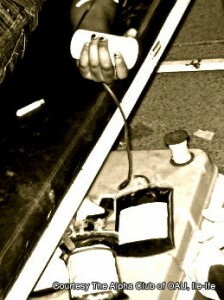 So we went ahead and I had my first, second, third…blood transfusions, I needed while in Nigeria. That would not be the last because by the time they figured out what was wrong, things were now beyond repair and I was in need of a miracle. That miracle would come in the form of a renal transplant almost seven years after my first blood transfusion. The whole time I was on renal dialysis, I needed a blood transfusion every now and again because I suffered from chronic renal anaemia. In London, I readily accepted them because I trusted that it had been screened and I would not be put in harms way. Almost five/six months after my first blood transfusion in Nigeria, a blood screening in London, had the potential to make it near impossible for me to ever get a renal transplant. Why? I had been infected with a viral infection that can also lead to acute and chronic liver disease, during one of the transfusions I had in Nigeria. There are a lot of things from this period stored in my memory and the most vivid one is the fact that, at the hospital where I was being treated, they moved me into an isolated room for all my treatment sessions. When the nurses or doctors were coming to see me, they were dressed like scientists, the kind we see in films. I mean they had the gloves, overalls and face cover – if you have ever seen the movie Outbreak, with Rene Russo and Dustin Hoffman, it looked like one of those scenes in the hospital, where the infected patients are being treated. Why do I share my story? Be assured, it is not for pity because I am in a different place today, one I happen to love and I took ownership of my story and journey a long time ago. My body successfully cleared the viral infection, thanks to some feisty anti-bodies. Those bad boys and girls serve me well when I need them to. I still have to deal with the challenge of renal anaemia. It was really bad during the years I was on dialysis, always tired, short of breath, funny looking eyes among other symptoms an anaemic person may have and mine was the rather bad type. While it is now under control, I have to take medication to keep it in check and if it gets out of hand, yes, I would need a blood transfusion. But I am no longer afraid to have one and I now understand why people should be encouraged to donate blood because believe it or not, when you do, you make a difference in the life of someone like myself or someone, who is worse off. The same way I encourage folks to donate blood is the same way, in times past when people have asked me if they should get on the organ donor register, I say yes but after they have given it serious thought and discussed it with their family. Your actions keep folks like me alive and give us a second chance at living. And that is something we don’t take for granted. You can trust me on that, whether you donate blood or organs, you are our best bet. Thank you. A few days ago, the Twitter update of a social media buddy, whose blog and musings I like a lot, Ktravula, caught my attention. He posted a link about a survey being conducted by the One Percent Project, Nigeria. I went to his website to find out more and was instantly moved. I felt like I had to do something. I may not be able to give blood but I can talk about it and help spread the word. Heaven knows that now, more than ever, we need more initiatives like this to help us. If you wonder why, let me refresh your memory. Lately, when Boko Hrama has gone crazy with its crusade to kill innocent people for a stupid and retarded cause, there is always a message on Facebook or Twitter that says they need blood at so and so hospital. If you are there, go and give blood. The first thing that registers with me is the fact that Nigeria does not have the capacity to deal with emergency situations like we have seen in recent times because the resources are not there. Are we so poor that we do not have a blood bank that can support us when such emergencies happen? Believe me, we are not, just negligent, under-resourced and backward. I do not apologise for my choice of words in describing what I think. Hence, the One Percent Project, which is a citizen’s effort to bridge the gap between blood donors and blood recipients in Nigeria within that crucial moment when life and death depends on the availability of clean blood and willing donors, is one initiative we should all support. We are going to need similar ones from now on. While my prayer is that Boko Haram will be cut off from its root, it should not stop this initiative from growing. There are people in hospitals that need help like I did all those years ago and people will continue to need help. According to Temi Giwa, president of the NGO, “We believe that if one percent of Nigerians sign up to give blood whenever called upon, more than half of lives lost today in car accidents and bomb blasts would be saved. As it stands, 25 percent of today’s maternal mortality in Nigeria, due to the unavailability of blood will become a thing of the past.” One Percent aims to be the missing link between willing blood donors around the country and the hospitals that need them in times of emergency. “We believe that if just 1 percent of Nigerians (1,600,000 people) would sign up to be contacted for blood in case of emergencies, we would have solved one of the most pressing problems in healthcare in Nigeria and saved more than 13,500 lives every year. Nigeria needs about 2 million pints of blood annually. It needs the majority of donated blood to come from voluntary non-remunerated donors. At a time when the nation’s population continues to grow, the timeline of the country is dotted by major traumas. 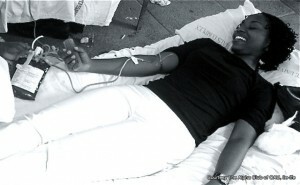 Nigerians hardly donate blood voluntarily. Those, who do donate blood belong to a generation that is fast disappearing and the little blood collected is not properly screened or distributed. Many Nigerian lives are lost or severely handicapped because of the lack of blood. The lack of proper screening means people are still getting infected like I was back in 1996. However, with the One Percent Prophet, there is hope because this is a vision being steered by individuals who are dedicated to the work at hand and they understand the territory they are moving into. They are not doing it alone, they have enlisted a group of professional healthcare workers, who are hungry for a change. This is where I say I do not have much to give but to ask my fellow Nigerians to wake up and respond to this clarion call for help. We need you to take the survey and get involved. Encourage friends and family too. Together, we have a chance at saving more lives but if we go it alone, we are certainly going to lose more lives that we bargained or would have wanted. I have no idea where I would be now if I didn’t get that first blood transfusion. Yes, I was very angry at what was later discovered and the limbo it placed me in but if I did’t have that very first transfusion, my story could all together be different. I shared my story because it could easily be any one of us in a situation, where we need this vital help. I plead with you, save my life, save a life and together, let’s save lives. Want to help? Why not start by taking this quick survey – One Percent Project Survey – it will only take five minutes of your time. Thank you in advance. This entry was posted on Friday, December 30th, 2011 at 5:55 am	and is filed under Africa, African Diaspora, Life, Nigeria. You can follow any responses to this entry through the RSS 2.0 feed. You can leave a response, or trackback from your own site. Thanks for putting this in focus. We have a funny attitude when it comes to blood donations, I remember someone asking me if he had enough blood for himself talk less of giving it to someone else! I hope everyone who reads this can support this project. Unfortunately for me I cannot donate blood here in the UK because I have lived in Africa but its a topic worth talking about. Thank you for this very moving post. Thanks KT and for bringing it to my attention.